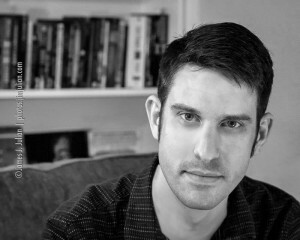 Interview with horror author Lucas Mangum + a review of his debut Flesh and Fire! I first met Lucas Mangum five years ago when he was living near me in Pennsylvania. He was a force then who brought writers together with his staged recorded readings. Since moving to Texas he’s continued his force in the horror community, writing and talking about books and movies. I’m excited to share his debut novel here, FLESH AND FIRE, the 8th book in Journalstone’s Doubledown Series and featured alongside DARK OF NIGHT, a new novella by Jonathan Maberry and Rachael Lavin. Read my interview with Lucas and see my review of FLESH AND FIRE below! 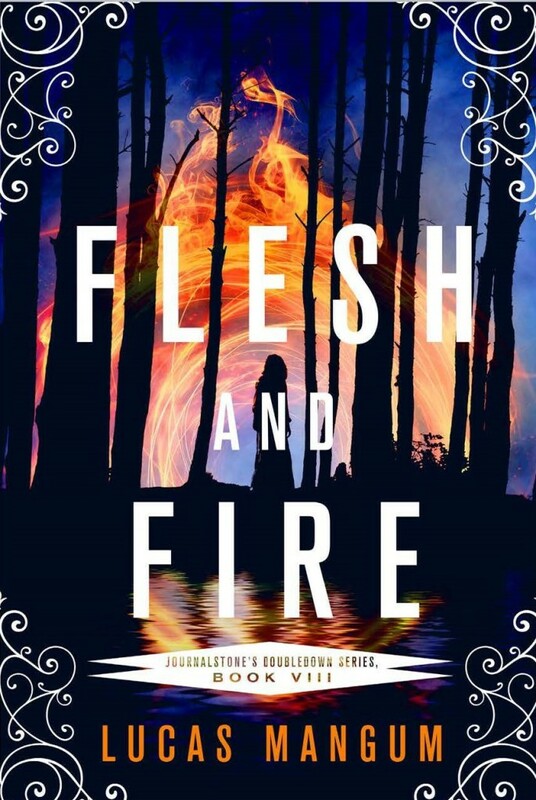 FLESH AND FIRE is a wild ride blending horror, suspense, and romance with elements of my favorite TV show, Supernatural. It starts intense and doesn’t let up, raising question after question that the characters must race to find the answers to–before they die. In a world where people are destined for pain, we are thrown into a dark place between hell and a hopeless world and Mangum skillfully uses the creepy setting to convey this landscape. With a truly evil villain who seeks pain as pleasure and holds captive one girl who delivers both, we discover that a love lost may be the answer to her escape. But is it enough? If you like mystery wrapped in darkness with characters spiraling into each other on a crash course to their destiny then FLESH AND FIRE is for you! I mean look at this AMAZING cover, right? Now it’s time to meet horror author Lucas Mangum! 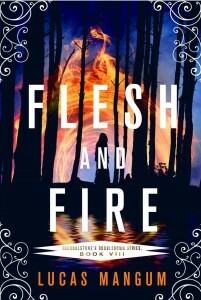 FLESH AND FIRE has elements of the TV show Supernatural (which I love!). Did this show or other shows/movies/books/writers influence your writing? I am total nerd for Supernatural and have a massive man-crush on Jensen Ackles. I mean, just look at that face! Anyway, during the book’s inception and first draft, I still hadn’t started watching Supernatural. I had always assumed it was the type of show with a gorgeous cast and not a lot of substance, but on a whim, I started watching the show while I was writing the second draft of FLESH AND FIRE, so I’m sure some elements from the adventures of the Winchester boys seeped into my stream of consciousness. Most prevalently, I think watching and studying the show helped me think of ways to write myself out of corners. The way each episode and each arc of Supernatural plays out, particularly during the first five seasons, is not just quality TV, but also easy to digest and analyse from a storytelling perspective. I also watched a lot of Breaking Bad, which, more than anything, made me less afraid of slowing down the action while diving deep into the backstories of my characters, as that show jumps around in time a lot. As long as what’s unfolding is interesting and relates to the characters’ main struggles, I think readers or viewers will pay attention. As far as books go, I was inspired to write a horror story with a strong romantic element after reading ANIMALS by John Skipp and Craig Spector. I like how character-driven the narrative is. I like how the first half of the book is basically one long chase. I like the meanness of the villain and the intensity of each character’s relationships to the other characters. Also, have to give the obligatory shout out to Clive Barker’s THE HELLBOUND HEART, and show some love to most of Brian Keene’s Leisure titles and the scariest novel I’ve ever read, COME CLOSER by Sara Gran, as they were very much on my mind while crafting FLESH AND FIRE. Your two main characters, Chloe and Todd, are both musicians. Are you also a musician and how did that factor into the story? Guilty! I sing and play keyboard, but not professionally. I used to be in a band, but these days, music is more of a therapeutic release for me. Every once in a while I tease recording something, but I’m so immersed in writing prose, I find it difficult to go all-in with a separate project. All that said I miss playing shows and singing in front of people. There’s really no feeling like it, especially when the audience is into it. Music is probably the closest to people will ever get to making true magic. I believe that firmly. Music is more than an art form. It’s spiritual. A religion, if you will. By having my main character be a musician who no longer plays, I, in essence, hoped to create the equivalent of a mythic or religious figure who has lost his way. There are many characters in FLESH AND FIRE. Are there parts of you in any of them? I think it’s impossible not to put at least some of yourself in your characters. One author who I love and respect says that you shouldn’t do that, but then I read his book and everything he was interested in over the two years he was writing it made its way in. The characters, the scenery, even elements of the plot were all things he and I had conversations about, so if it feels natural and still reads like a story, I think putting yourself your book is perfectly okay. As far as FLESH AND FIRE goes, I wrote the first draft after listening to a CD of my music for the first time in years. I was working for a bank at the time (like Todd), and felt both removed from and deeply in love with the person I used to be. The guitarist on those songs committed suicide, which broke up our band, so listening to the CD also brought a lot of grief and anger to the surface. All of that was on my mind during the process, so the first draft of FLESH AND FIRE was less like writing a book and more like draining the ooze from a staph infection. The demon in your story, Samael, is horrifyingly evil yet you also reveal a pitiful side to him with his past. What inspired you to write such an evil character? I’ve always liked villains. When I was a teenager going to a religious school, I felt legitimately bad for Satan. I mean, here’s this dude who’s incredibly gifted and loves God with his entire being, literally his body makes music in tribute to his creator, yet he always plays second fiddle to humanity. All he wanted was God’s love and he was met with constant rejection. It is only with his pride wounded, and I would even argue that his heart was broken, that he rebels against heaven and ultimately grows into the deceptive, destructive, irredeemable devil. Samael has what I consider to be a lot of humanity’s worst qualities. He’s possessive. He’s vain. He takes pleasure in committing violence against others, even the innocent. I gave him a pitiful past, entrenched in violence and sorrow, because I think terrible things only go on to breed more terrible things and if those terrible things are fed, as Samael’s are, by either false beliefs or positive reinforcement, they can twist someone into something almost unrecognizable. I’ll be frank. There were periods in my life where I was angry about the way relationships had turned out or my job situation or what I observed about the outside world, and I externalized that anger more than I should have and ended up not treating people the way they should have been treated. But what was crazy about those dark periods for me, Donna, was that I always felt I was in the right (even if I regretted it the next hour, day, or week) and I never stopped feeling like a human being, never stopped loving or wanting love. Now, I’m not excusing villainous behavior, but I think by recognizing that no one just wakes up with malicious intent, we can maybe prevent the spread of evil by being a little kinder and more mindful of each other’s struggles. Or at the very least, and admittedly less noble, have complex and interesting characters to read and write about. FLESH AND FIRE is a blend of suspense, horror, and romance. Where do your dark stories come from? Experience…or your own fears? I’ve always enjoyed scary stories and my penchant for writing particularly gruesome tales and reading them in front of class got me banned from show-and-tell in the fourth grade. That’s right. I have a banned book. Now why isn’t my name on a coffee mug? On a more serious note, experiences have always played a big part in pretty much everything I write. One of my favorite things to do is choose a situation or series of situations from my life and ask myself, “well, what if I did this instead.” I’ve managed to live an interesting life and encounter some truly compelling characters, some of them tragic, some of them heroic, some of them truly ugly inside. The best are the ones who have all those traits and more. As far as my own fears go, I don’t think I could write horror unless I had things in my life I was afraid to lose. We all have those things and I think I’m very fortunate enough to have caught the storytelling bug. I know some people who live their entire lives in fear and have no outlet for those fears. Do you see Chloe and Todd’s story continuing in another book with a FLESH AND FIRE series? Yes and no. I am working on a sequel called BLOOD AND BRIMSTONE (I like alliterations) and that will explore more of the mythology and show us a lot more of Hell than we get in the first book. However, at this point, I’m not sure what role, if any, Todd and Chloe will play as I’m really pleased with how their story ended up in FLESH AND FIRE. The main characters in the sequel will be Todd’s kids, but I’m not ruling out appearances from any of FLESH AND FIRE’s cast. What types of research, if any, did you do for FLESH AND FIRE, and did your research have any particular influences on the plot or characters? The best research I did for FLESH AND FIRE was accidental. While I was working on the second and third drafts, I came across an essay called “The Great Lawsuit” by Margaret Fuller. It’s sort of a proto-feminist piece from the American Renaissance where she references Orpheus and Eurydice, and talks about the male and female heroes rescuing each other, rather than one rescuing the other. I thought that was kind of cool and employed it in FLESH AND FIRE. If you read closely, you’ll see each character is in their personal hell. Todd’s hell is this monotonous, domestic 9-5 life where he’s unfulfilled and longs for a better time. Chloe’s is more literal. In their quest, though, they’re equal and even though they rely on each other, important steps in their journeys are taken alone. I also studied the Bible, Dante, Milton, the Greek myths (namely the story of Hades and Persephone) and the Hellraiser films to get a good idea of what all had been done before. It should go without saying that as an author (artist, filmmaker, whatever) you want to try avoiding recycling ideas unless you can reinvent them in an interesting way. You have several female characters in FLESH AND FIRE. How difficult was it for you to write from a female perspective? Was there any special process that helped you get inside the female psyche? Writing from a female perspective came naturally to me. I’ve always had a lot of female friends and between my wife, my mother, and all the awesome women writers I know and interact with, I’ve had no shortage of strong women in my life. Because of that I didn’t really have a special process per se. I just tried to be real. What project is up next for you? More demons and supernatural and horror or something completely different? I spent the last year and a half trying a lot of new things. While my experimentation in other genres has yet to yield anything publishable, I’ve learned so much and I don’t feel as though they were wasted endeavours. Bizarro, aside from being one of the greatest communities of writers ever, challenged me to always think outside the box with characters and plot devices. Crime is unmatched when it comes to economic prose. Mainstream thrillers can teach a lot about plotting something that is impossible to put down. Middle grade fantasy employs a great sense of wonder, something that I think can work well in a horror story if juxtaposed against the usual dread. Having added those extra tools to the tool kit, I’ve come back to what I know and love. I’m working on two supernatural horror novels. One is the aforementioned sequel to FLESH AND FIRE. The other is called WE ARE THE ACCUSED, which is about a town set upon by demons in the days leading up to a festival celebrating a hundred years since their expulsion. Lucas Mangum has lived in San Diego, Philadelphia, and currently resides in Austin, TX. He enjoys wrestling, cats, wrestling with cats, and drinking craft beer while crafting weird stories. Visit his website at Lucas Mangum – Dark Fiction Author and follow him on Twitter @LMangumFiction and talk to him about books and horror movies. 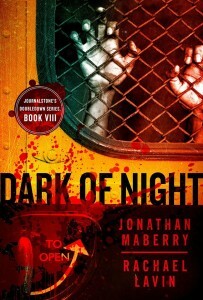 FLESH AND FIRE is the 8th book in Journalstone’s Doubledown Series and is featured alongside DARK OF NIGHT, a new novella by Jonathan Maberry and Rachael Lavin. In the midst of a midlife crisis, Todd is haunted by Chloe, the lover who died not long after their relationship ended. When Chloe escapes Hell in search of the peaceful rest that has eluded her, a demon named Samael is on her trail and she needs Todd’s help. While on the run Todd and Chloe face demons real and personal, soul-threatening danger, and their long-buried feelings for each other.